When is the best time to floss? At GKG Orthodontics, we prefer our patients to practice good oral hygiene between office visits. Part of that process includes flossing, which Drs. Grady, Kastner, and Gornick will tell you, is the process of cleaning between the teeth to remove food and debris from the areas that are hard to reach with a toothbrush. When food is allowed to remain between the teeth, it provides a breeding ground for bacteria, which can cause periodontal disease. You can floss either before or after brushing, according to your own preference. By flossing first, you can brush away dislodged food debris afterward. On the other hand, brushing first allows you to loosen plaque between the teeth, making it easier to floss more effectively. Whichever you choose, the most important goal is to floss thoroughly. That means using a fresh strand of dental floss each day, and carefully pulling it back and forth between all of the teeth. 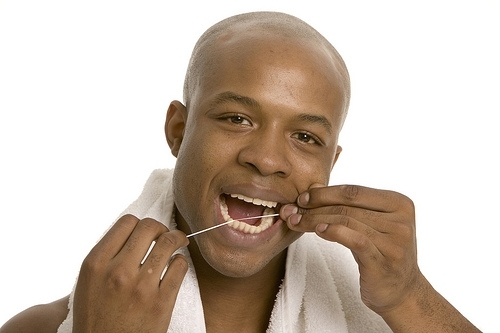 Do not skip flossing because your teeth look or feel clean. Unlike brushing, you need only floss between your teeth once per day. Although you may choose to do it in the morning or afternoon, many prefer to floss at night to prevent food and debris from remaining in the crevices of the teeth overnight. This could prevent the build-up of plaque too, which is a cause of tooth decay. If you have questions about your flossing technique or what type of floss is best for your teeth, contact our office. Our staff will be more than happy to assist you in perfecting your home hygiene regimen. In most cases, you can choose between interdental cleaning picks or flexible floss strands to perform your daily flossing routine. If you have permanent oral appliances or restorations, be sure to follow the flossing instructions provided to you, and contact our Wexford, PA office with any questions. It's a moment many of our patients have experienced. One second you're chewing on a piece of gum, then suddenly you forget to keep chewing and swallow the entire rubbery gob whole! It's at this point you remember your mother warning you as a child that if you swallow gum it will stake a claim and take up residency in your belly for seven years. Drs. 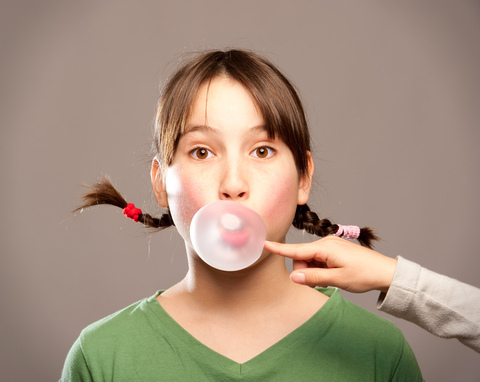 Grady, Kastner, and Gornick and our team at GKG Orthodontics hate to take all the fun out of the mystery, but the truth is that chewing gum, when swallowed, will enter your stomach and move through your digestive system just like any other piece of food. So, if you ever accidentally swallow a piece of gum, there is no need to worry! That being said, it's important to know that gum does not have any dietary benefits, so while it’s not exactly harmful to swallow, you still want to avoid swallowing it. If you are an avid gum-chewer, we encourage you to chew sugarless gum, especially if you are wearing braces, because gum with sugar can lead to cavities. Sugarless gum still has the same amount of flavor, but has fewer cavity-causing ingredients. In fact, many brands contain an additive called xylitol, a natural sweetener known to fight cavity-causing bacteria. Xylitol is also known to increase salivary flow as it rinses away plaque and acid. The fact is, when the bacterium in your mouth breaks down sugar, what’s left behind is acid. This acid eats away at the enamel coating of your teeth, causing holes that we call cavities. Cavities can lead to other long-term mouth problems if they are not treated in time, so it is best to try and avoid overexposing your teeth to too many harmful substances! If you have any questions about chewing gum, please contact our office. Happy (sugar-free) gum chewing! Diet Soda vs. Regular Soda: Which is better for teeth? When most patients ask Drs. Grady, Kastner, and Gornick this question, they're thinking strictly about sugar content — cut out the bacteria-feeding sugar that's present in regular soda by opting for a diet soda and it will be better for your teeth. That seems logical, right? Well, there's a bit more to it than that. Let's take a closer look at how any kind of soda can affect your dental health. The main culprit in these drinks that leads to decay is the acid content. Diet sodas and other sugar-free drinks are usually highly acidic, which weakens the enamel on your teeth and makes them more susceptible to cavities and dental erosion. The level of phosphoric acid, citric acid, and/or tartaric acid is usually high in sugar-free drinks so it's best to avoid them. Some patients also enjoy drinking orange juice or other citrus juices. These drinks are high in citric acid and have the same effect on the enamel of your teeth. So what about regular soda? We know the acidity of diet sodas and sugar-free drinks contributes to tooth decay, so what about regular soda? Like we alluded to earlier, regular soda is high in sugar — a 12 ounce can contains roughly ten teaspoons of sugar — and sugar feeds the decay-causing bacteria in the mouth. This also includes sports drinks and energy drinks, which are highly acidic and loaded with sugar too. So these drinks are a double-whammy of sugar and acidity your teeth and body simply don't need. The problems caused by both diet and regular soda is exacerbated when you sip on them throughout the day. If you drink it all in one sitting, you won't be washing sugar and/or acids over your teeth all day long and your saliva will have a chance to neutralize the pH in your mouth. Drinking beverages that are lower in acid is a good step to take to keep your enamel strong. According to a study conducted by Matthew M. Rodgers and J. Anthony von Fraunhofer at the University of Michigan, your best bets are plain water, black tea or coffee, and if you opt for a soda, root beer. These drinks dissolved the least amount of enamel when measured 14 days after consumption of the beverage. Still have questions about soda, sugar, and acid? Give our Wexford, PA office a call and we’d be happy to help! Bad breath, or halitosis, is probably not a matter of life or death. But it can make you feel self-conscious and have a negative impact on your life. The majority of people suffering from bad breath are dealing with oral bacterial. However, there are other causes of this embarrassing problem. Learning more can help you fight this solvable problem. Dry Mouth. A decrease in saliva flow can be caused by several things. Most often, medication or mouth breathing are the culprits. As saliva helps wash away food particles from your mouth, it prevents bad breath. Dry mouth can be dealt with by stimulating salivation. Gum Disease and Poor Oral Hygiene. Not brushing and flossing well enough or with enough frequency can lead to gum disease, which leads to bad breath. Halitosis can be a sign that plaque is present on your teeth. Food-Related Bad Breath. Food particles that aren't brushed or flossed away attract bacteria that leads to bad breath. It's especially important to brush after eating strong-smelling foods, such as garlic or onions. Smoking and Tobacco. Tobacco is bad for your health, and that includes your oral health. Smoking or chewing tobacco can contribute toward the development of gum disease, as well as oral cancer. Mouth Infections and Other Medical Problems. A mouth infection, sinus infection or even the common cold can cause you to temporarily have bad breath. Even conditions such as diabetes and reflux can cause halitosis. It's always wise to see Drs. Grady, Kastner, and Gornick to help determine the cause. Even if you maintain good oral hygiene, it's important to see Drs. Grady, Kastner, and Gornick at our Wexford, PA office to deal with or avoid problems with bad breath. We can help you uncover the cause of halitosis, while also providing solutions that allow you to enjoy fresh breath without relying on mints and breath fresheners. As is the case with all things related to oral health, we are your number-one ally when it comes to eliminating the problem of bad breath.